It's been a stressful week for the entire week! I am glad I manage to pull through, I been lacking sleep as well so I am totally in Zombie mode currently while blogging here. Just wanted to do a quick update on my weekend outfit post as per usual. And also finally, I have finished my Christmas weekend outfit post too! 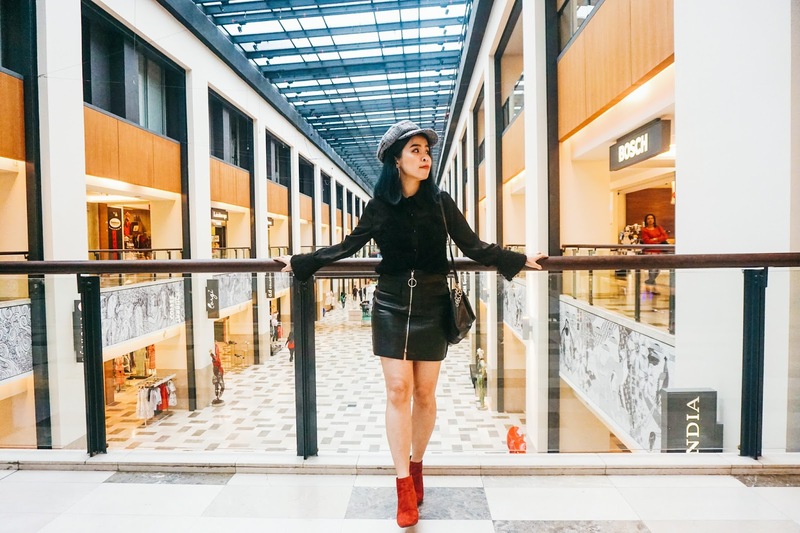 Hopefully in the year 2018, I can try and take up more challenges in creating more outfit ideas for my weekend outfit post. Upgrade some of photo editing skills too. For today all black outfit, it was such a rare matching I will choose whenever I head out. I will either go with some colors and black. Definitely not in All Black, but still I manage to pull through this outfit. I match with my favorite CNY boots to complete this look too. A close look at my Top and Skirt. 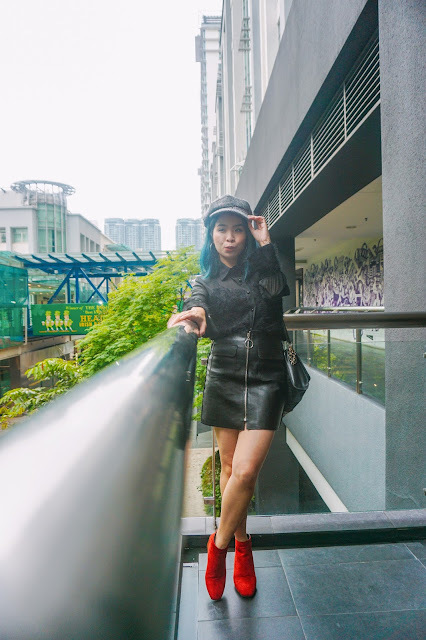 I have been wanted to get one leather skirt for the longest time! Manage to get this in less than RM30 and I'm loving it already. The black color skirt is so easy to match with any color the of the top! Since I love wearing a shirt and when I wear it with the skirt, it creates a really casual and feminine look too. For the top, it was a fake two-piece design. Which the singlet design and the sleeve come in hairy texture and the inner is in chiffon material. It was a really unique texture top that I fall in love immediately. Also, I rarely found or own any black top that I really like too! Since I am all black, I decide to wear this Red Boots for my CNY outfit. I never try matching pieces like this! Black and Red color matching are such a pretty and cool combination of color. 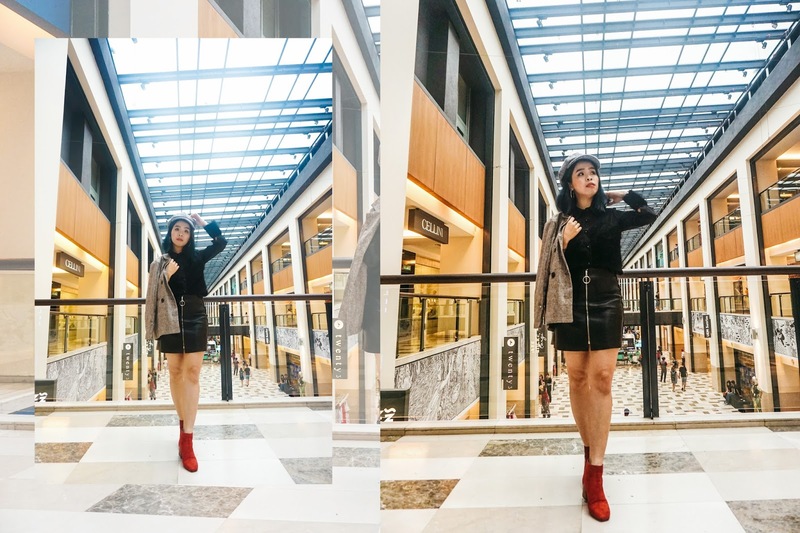 I have been searching for nice red boots that are affordable and good quality. Manage to found this pair of red boots in only less than RM30 too! Here's the entire look that I wear on that day! This outfit is definitely my favorite #sharonootd for the month of January. Add one artist cap to accessories the entire look. I have been into this kind of checkers or plaids recently. So when I saw this for the cap design, I was drawn to it. Even though this was an all-black look of the day, but let's be creative by adding some colors and accessories to your outfit! Some of the shots indoor with a darker gradient and hue of my outfit. 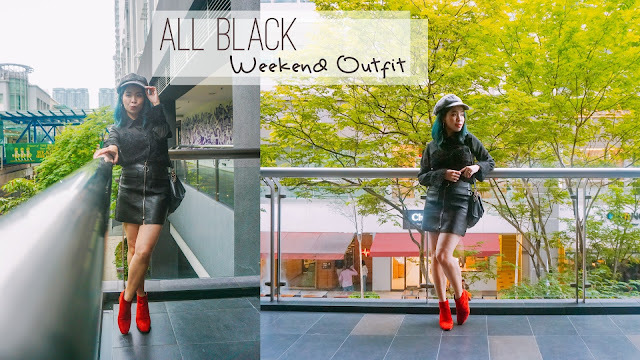 Check out more of my Weekend Outfit post here!! Wishtrend: Click HERE and Use the Promo Code "MERRYMARCH" to enjoy extra 5% Discount Off on your purchase!